An all-IP future is no longer such a distant possibility. Last week, AT&T announced that it would hold test trials to transition wire centers to all-IP services in two communities: one rural (Carbon Hill, Alabama) and one suburban (Kings Point, Florida). Just three months into 2014, our nation is truly embracing the idea of ‘out with the old and in with the new.’ Our communications infrastructure has long been reliant on centuries-old technology. The time has come to upgrade these antiquated networks to a network that provides consumers with far more options for their communications needs. As my friend Larry Downes and his co-author Paul Nunes write in their book Big Bang Disruption, “The transition to digital networks [would] significantly counter the obstacles that keep 20 percent of American adults from joining the Internet.” For that reason alone, we’d be crazy not to embrace these next-gen all-broadband networks. It’s good for consumers, both existing and potential, across the country. We’re traveling the state to help our members make progress on the issues that matter most. Don’t hesitate to reach out should there be a roadblock CALinnovates can help remove for your company to experience the growth and success you’re striving for in Q1 and beyond. 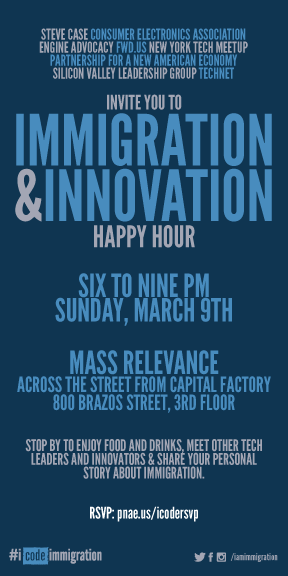 Join DC-based Mobile Future for SXSW for Mobile Margaritas, a meet-up with other mobile leaders, innovators and entrepreneurs. If you haven’t downloaded the SeeClickFix app on your iPhone, Android, Windows Phone, or Blackberry, now’s the time. Founded by Ben Berkowitz and Kam Lasater, SeeClickFix is a communications platform for citizens to report non-emergency issues. Governments also use the platform to track, manage, and reply — ultimately making communities better through transparency, collaboration, and cooperation. It’s free on the app store of your choice.